Extreme weather: quite the norm, really. In the interests of a peaceful life we have kept away from Mr Climate's blog at MeteoSchweiz for a while. Forgetting that a climate conference was currently taking place in Bonn and thus there was one further reason to lie low, a wild click in the middle of the waether forecast brought up his his latest post. Mr Climate. One swig of the green stuff in the glass and look what happens. 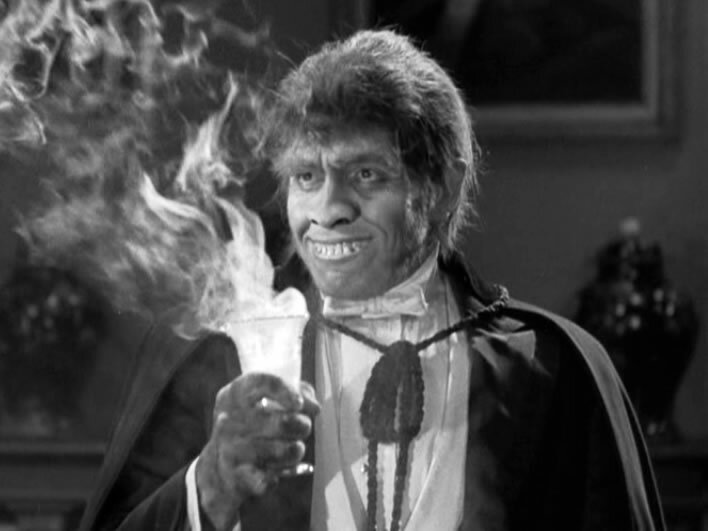 Image: Fredric March as Mr Hyde in a still from the film Dr Jekyll and Mr Hyde from 1931. Mr Climate's piece begins as we might expect with a couple of paragraphs of the usual 'warmest [something] since [whenever]' flatulence, this time taken from the 'provisional' report of the World Meteorological Organization (WMO), that warmist behemoth. Not at all a surprise or a cause for alarm, because in a world that has been steadily warming – thank goodness – since about 1800, progressively higher temperatures are only to be expected. If this progression continues our descendants can look forward to going through successively the warm periods corresponding to the cool civilisations of the Middle Ages (troubadours! ), the Romans (togas!) and the Minoans (whatever!). The prospect of the citadels of the modern Mammon being submerged under the laughter of Catullan waves – well, no sleep need be lost about that. We take anything the WMO says as sceptically as that other of Mr Climate's favourite alarmist sources, World Weather Attribution (WWA), a.k.a. Climate Central. Everywhere in the world this year there have been innumerable local extreme events such as heatwaves and forest fires. A coastal El Niño caused heavy precipitation, earth slides and deaths in Peru. The North Atlantic experienced a very active hurricane season. Harvey, Irma, Maria and José caused great damage in the Caribbean and the USA. Events such as these cannot be attributed directly to climate change, but human emissions of greenhouse gases contribute to their frequency and intensity. This carefully nuanced statement is simply not proven. Even the IPCC, which in its nature would love to find some demonstrable connection between patterns of extreme weather events, had to state unequivically in Chapter 2 of the 2012 IPCC fifth report (its most recent report) that no causal connection could be found. Overall, the most robust global changes in climate extremes are seen in measures of daily temperature, including to some extent, heat waves. Precipitation extremes also appear to be increasing, but there is large spatial variability. There is limited evidence of changes in extremes associated with other climate variables since the mid-20th century. Current datasets indicate no significant observed trends in global tropical cyclone frequency over the past century … No robust trends in annual numbers of tropical storms, hurricanes and major hurricanes counts have been identified over the past 100 years in the North Atlantic basin. In summary, the current assessment concludes that there is not enough evidence at present to suggest more than low confidence in a global-scale observed trend in drought or dryness (lack of rainfall) since the middle of the 20th century due to lack of direct observations, geographical inconsistencies in the trends, and dependencies of inferred trends on the index choice. Based on updated studies, AR4 conclusions regarding global increasing trends in drought since the 1970s were probably overstated . However, it is likely that the frequency and intensity of drought has increased in the Mediterranean and West Africa and decreased in central North America and north-west Australia since 1950. In summary, confidence in large scale changes in the intensity of extreme extratropical cyclones since 1900 is low . There is really not much more to be said here – the data says what it says, and what it says is so unavoidably obvious that the IPCC has recognized it in its consensus. According to this, Mr Climate's conclusion that 'human emissions of greenhouse gases contribute to their frequency and intensity' is, in effect, completely wrong. Remember that the points above come from the IPCC, the central authority for climate alarmism. If the IPCC had been able to find the slightest CAGW signature in the occurrence of extreme weather events they would have been screaming it from the rooftops. They have sought – and sought desperately – but not found: no link has ever been established. However, for the WMO, WWA and, it seems, Mr Climate, the IPCC's own 'science' can be ignored when it delivers the wrong message. Why should this worry us? Good question. Here's why: MeteoSchweiz is an official organization of the Swiss Government and this propagandist nonsense is paid for by the public's money. The minimum requirements for such organizations should be honesty and transparency. In contrast, Mr Climate appears to be merely a partisan propagandist, an IPCC science-denier, even. Überall auf der Welt gab es auch in diesem Jahr unzählige lokale Extremereignisse, wie Hitzeperioden und Waldbrände. Ein Küsten-El-Niño sorgte in Peru für heftige Niederschläge, Erdrutsche und Todesopfer. Der Nordatlantik erlebte eine sehr aktive Hurrikan-Saison. Harvey, Irma, Maria und José richteten in der Karibik und in den USA grosse Schäden an. ^ Ereignisse wie diese lassen sich zwar nicht direkt dem Klimawandel zuordnen, zu ihrer Häufigkeit und Intensität tragen die menschlichen Treibhausgasemissionen jedoch bei.